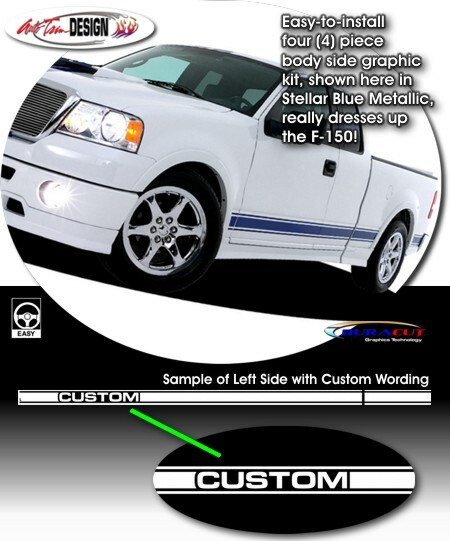 Set your '04-Current Ford F-150 apart from the rest with this classic Body Side Graphic set. Kit consists of a piece for the main portion of the truck and a piece for the rear of the bed. These pieces will fit a wide variety of F-150 models (Regular, SuperCab and SuperCrew). Choose from a solid front door area or customize it with unique wording (wording starts approximately 4" [10.16cm] from leading edge of door). Simply enter the Custom Wording of your choice (up to seven  letters/digits/spaces) below and we'll make it happen. Either way it'll look Terrific! Slight trimming required at doors jambs and at each wheelwell. Note: While this graphic kit is sized for the '04-Current Ford F-150, it may also fit other pickup truck models as well. Measuring your vehicle prior to ordering is suggested.